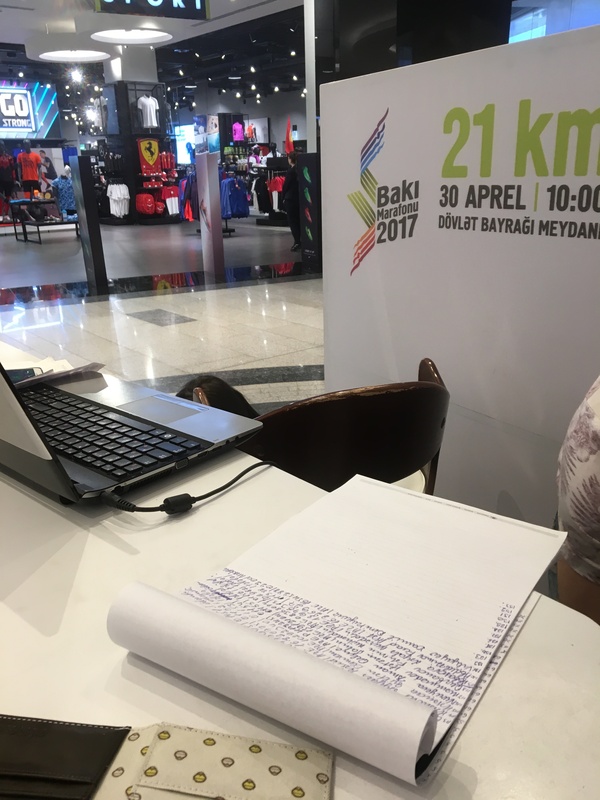 I’m in Baku, Azerbaijan (a former Soviet republic north of Iran) as a part of Baku 2017, a small multi-sport games for this region. I’m here for a month. 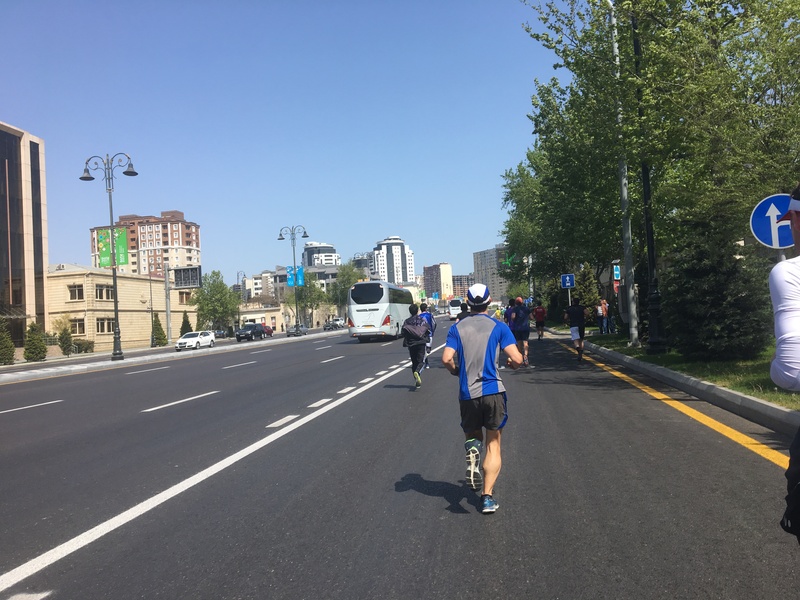 Before coming, I found out online that there was a half marathon happening while I was here and quickly figured out that some colleagues were also planning to run. Excellent, I thought. Try as I might, I couldn’t find previous results online, or much information in general. No matter, it will work out. Right? Online registration involved putting in my passport number. No, thanks. In person sounds good. “Supposedly”, there were 12, 000 entries. That’s a lot of handwriting. I was handed them my $30 (or so), they handed me a sticker, instructions in Azeri and sent me on my way. Also: buses will follow the runners en route should they wish to stop and take transport to the finish line. We meet and walk to the start line, which happens to be barely organized chaos and a sea of people. Almost no one speaks English. We are dressed as runners (shorts, tees, runners. Pretty standard stuff). Wouldn’t you know, this put us in the minority, surrounded as we were by jeans, leather jackets and completely inappropriate running footwear all ’round. We head towards the start arch, with a vague sense of which direction we should be facing. Pretty soon, we’re in a crush of people — personal space, be dammed – and the police are gesturing us to move backwards more. There’s nowhere to go, we can only laugh and try not to touch people inappropriately. With 5 minutes to go (by my watch), suddenly it appears that we are off and the jeans and leather jacket brigade are off and flying. We’re talking full, zigzag, sprint to… where exactly? Since there were no course markings, no barricades, and, the best yet, no timing mats or timing chips, it would appear that so long as you made it across the line at the stadium, doesn’t matter how you get there, CONGRATULATIONS! I saw the first person pull the pin at 1.98km in. There was a roughly 5km out and back section. I was pretty lonely out there, just trucking along and minding my own business. From what I could see, there were maybe 35 people ahead of me, total. I couldn’t spot any women (I tried). The men in this group didn’t appreciate me passing. I’d run by, they’d surge. I’d run by again (having maintained pace), they’d surge again and then eventually give up. Over and over. So that was… interesting. As we rejoined the course at the start of the out and back, suddenly the pack got way larger once again. With men in cargo pants and Keds. Who weren’t sweating. What?! Where did you guys come from? I suppose that out and back maybe wasn’t mandatory? And on and on it went. I’d come upon people running in dress shoes, casual outfits, from seemingly nowhere. Or, you know, subways. I crossed the line and was given a little card that said “12”. I assume this means I was the 12th woman. No matter that I only ever laid eyes on 2 women ahead of me. Cool, cool. I signed my name on a piece of paper, was handed a water bottle and shooed away. Literally. I wandered around the finish area looking for food and more water, and got to cheer on Marco and Kara as they crossed the line together. We searched in vain for bathrooms, walked another 2kms or so for Marco’s gear. Listened to yammering in Azeri. Could have purchased a carpet, chose not to. As you do, in race expos. In the end, we got medals. Actually, scratch that. We have to go get our medal between May 5-9, passports in hand.